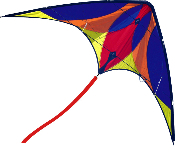 Successful first flights, precision handling, durability and a large wind range make the Cherry Bomb an excellent choice for entry-level sport kites enthusiasts. Built tough to handle the serious demands of learning. Responsive to give you maximum control, the Cherry Bomb is fully trickable.